The brothers were able to invest in a 50-acre plantation in Malaysia with different varieties of durian. 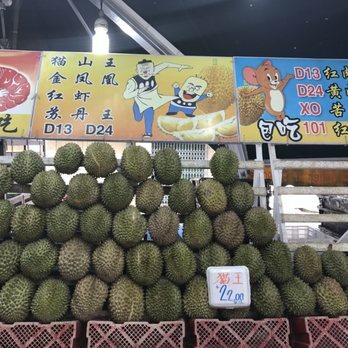 They have always ensured that the durians they are selling are of high quality. The elder brother is managing their plantation, making sure that the trees are healthy to give nutritious and the best condition of the fruits. The younger brother, meanwhile, is overseeing their stall, giving all their best to serve their customers. When asked how they are able to rate among other competitions, they remarked that they keep their friendliness amidst the business engagements. Also, they mainly focus on providing the best quality of durians and customer service to consumers. In addition to that, isn’t their catering business the best advantage over all other durian businesses? I would like to assume that you already know the answer to that. As I mentioned before, they have planted different varieties of durian in their farm. This is because they strive to serve all of their customers’ preferences. They have D13 (to which they are the founders of this type), D101, Mao Shan Wang, D24, Golden Phoenix, Xo, Tekka, Merah, Black Thorn, and Gang Hai. The first three types I mentioned are their bestsellers. But, again, to each his own. Their customers mainly speak well of them although a number of consumers had minor complains about them like the area was a bit dirty due to scattered empty durian shells and the staff was too busy to pick them up. But the bigger percentage of the remarks goes to their excellent customer and product service, and the best quality of the durian. Buyers speak of their good experiences during their visits at Durian 36, saying that the crew is friendly and helpful of their needs. For the first-timers, the personnel patiently explain the differences between the types of durians and recommending something which they might really enjoy. And because they are open 24 hours, this is another huge advantage for those late-night cravings that people might have. Furthermore, they have other fruits available there such as mangosteen, mangoes, papayas, lychees, peaches, cherries, strawberries, and a lot more. They also serve freshly-squeezed fruit juices so you can still maintain your healthy lifestyle. Durian 36 is pretty well-known in Singapore because they cater to big business as well. They even had the Durian Fest last 2016 held at the Resorts World Sentosa. Judging by that event, I could tell that it was a pretty big ceremony and I’m sure that they were busy that time, too. Another thing about them is that, over the years, they were able to acquire the skill of being able to tell as to what kind of meat is inside the durian (at least a 70-80% chance) just by knocking on the shells with a knife and listening to the hollowness inside. Cool, isn’t it? I guess what’s magic to people is years of learning the skill for the durian vendors. By the way, there is a parting thought that the owners of the stall shared: “No amount of hard work can make your business thrive if honesty is not part of it.” Those are great words and I’m sure that business people can really have some motivation from that statement alone.